More casual dining than at Fabio Trabocchi’s Fiola, but the cooking is just as classy. 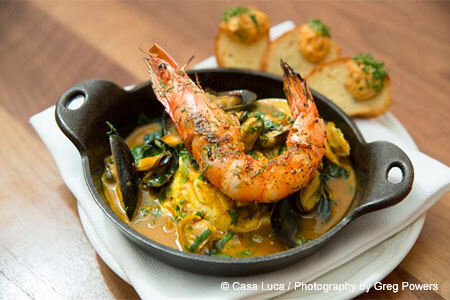 : With its outdoor seating area beckoning in clement weather, Fabio Trabocchi’s Casa Luca offers the kind of cooking that will excite even the most jaded DC foodie. Sadly, or perhaps it’s a reason to cheer, portions of the menu change regularly. So if you’re craving Trabocchi’s campanelle pasta topped with prawns and moistened with a shellfish broth, you may not find it on a return visit. Likewise with the roasted branzino with red peppers, olives and tomatoes --- a typical Italian feast. But not to worry: the menu is packed with tempting appetizers, cheese and salumi; there’s a low-calorie/low-sodium set-price offering, too, that includes an appetizer, entrée and dessert. If the season dictates, start with one of the salads --- both garnished with fresh flower petals and dressed with a subtle citrusy blend. And then for the desserts. Hazelnut coffee cake with a scoop of caramel gelato should become the house classic, though we also like the pistachio and orange semifreddo with vanilla meringues. Check out the wine and cocktail collections for some elegant libations.